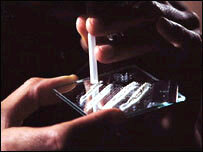 Suspected drug dealers' assets could be seized on arrest rather than conviction under new plans for England and Wales. Home Secretary Jacqui Smith said suspects found to be "completely innocent" would get their goods back. Addicts also face losing benefits unless they agree to see a drug "treatment adviser". But critics warned this could lead to more crime - and the Tories said the strategy was an "overspun gimmick" that did not stand up to scrutiny. The government says it wants to build on its previous 10-year strategy, which it claims has reduced drug use to an 11-year low and drug-related crime by 20% in the past five years. Home Secretary Jacqui Smith said: "We want to see fewer people start using drugs and for our society to be free from the problems caused by drugs. "We want those who do use drugs to enter and finish treatment and move on to lead healthy, drug-free lives. "We want communities to be free of drug-related crime and we want see tough enforcement of the law." She said the government would continue to "send a clear message that drug use is unacceptable" but it would also continue to provide help for people trying to get off drugs. And she said there would be more emphasis on helping families hit by addiction. "We expect drug users themselves to take responsibility, and will help them to do so," she added. The BBC's home editor Mark Easton says targets to get users off drugs are similar to the last 10-year plan, launched in 1998. The treatment strategy has involved persuading as many users as possible to sign up to a treatment plan and keep them on it for 12 weeks. Using this approach, every pound spent on treatment saves the state £9.50 in costs relating to crime and healthcare. But a document seen by the BBC states that claim is "out of date" adding "we need to be able to justify that drug treatment is still worth investing in". Drug agencies are also concerned about the effectiveness of treatment, our home editor says. Less than 3% of users emerge from treatment drug free each year, leading some to suggest the emphasis should be on abstention. Shadow home secretary David Davis, for the Conservatives, said the strategy was little more than a collection of "gimmicks" and re-announcements. "Labour's failure to tackle drugs has led to an increase in drug crime by 43%, cost Britain £110bn - more than this year's NHS budget - and left us with the worst problem drug use in Europe. A strategy to help users come off, and dissuade new users from starting might be a good idea. "The latest announcement is an explicit admission of that failure. Far from a coherent strategy, it scrambles together a range of gimmicks that barely even paper over the cracks of the government's failure." He said police already had the power to seize criminals' assets, if they applied to a judge during a criminal investigation, and cutting addicts' benefits would do nothing to improve treatment programmes. He called for a "zero-tolerance approach" to drugs - including a dedicated Border Police Force to tackle smuggling, the reclassification of cannabis, more "abstinence based rehabilitation" and better drug treatment in prisons. There is also a legal question mark over the seizure of assets on arrest, with Home Office minister Margaret Hodge earlier conceding on BBC Two's The Daily Politics that the policy could be challenged under human rights legislation. The government's strategy has been broadly welcomed by drug treatment charities - but some have warned that cutting addicts' benefits could lead to an increase in crime. Harry Walker, of Turning Point, said: "In real life such a policy could have unforeseen problems, including a higher bill for the taxpayer through health and crime costs. "We would want to see clear evidence from pilot programmes that such a policy would keep people in treatment and would not lead to problems becoming more intractable." He also criticised the strategy for not focusing enough on alcohol misuse but he welcomed plans to give more support to former addicts seeking employment and greater use of community sentences. The government's strategy includes plans to extend police powers to seize dealers' cash and assets on arrest, rather than conviction. It says: "Those who buy 'bling', plasma screen TVs and other household goods, to avoid circulating cash, will have their assets seized before they have a chance to disperse them". Previous efforts to confiscate the assets of drug dealers and other criminals have met with mixed results. The Assets Recovery Agency, set up in 2002, was criticised by the Commons public accounts committee last year for being "ill planned" and "unrealistic" after it spent £65m over four years to recover just £23m. The new strategy will widen what can be seized and scrap the 12-year limit within which recovery proceedings must be taken. The government aims to recover £250m a year from criminals by 2010.